The beaver (Castor canadensis) is the most significant instantaneous and long-term driver of landscape state and rate of change in wetland and stream systems. Its activity creates a variety of wet habitats that are found in association with multiple impoundments. In the Berkshire Range, observations of dam and lodge conditions and present and past food-harvest areas revealed no evidence of overproduction and their population appears to be in equilibrium. Their implementation of dam networks across this landscape is an elegant synthesis of natural terrain, hydrology, microhabitat, and evolutionary adaptation. Beaver ponds play a valuable and significant role in the formation of the region’s plant and animal communities. Their dams create ponds that contribute to the stabilization of water tables and help reduce rapid rain runoff. Dams also help reduce soil erosion and improve soil quality since runoff deposition occurs in quiet pools near beaver dams. The sizeable number of trees drowned by root inundation strongly augments food and space niche availability for a broad spectrum of insects, birds, small mammals, and their predators. Increases in wetted area and coarse woody debris loads directly benefit the amphibian community as does the availability of adjacent and protected upland refugia. Beaver habitat is thus regarded as a significant contributor to the support of native biodiversity in the area. 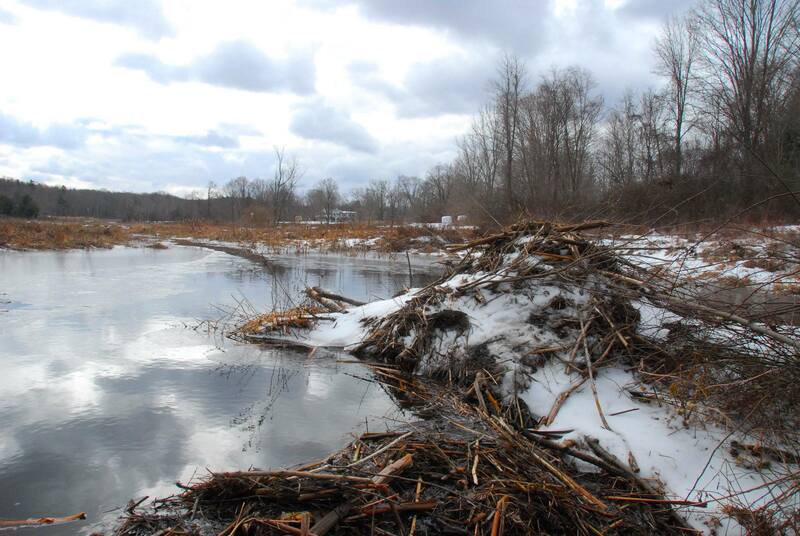 Beaver lodge and dam at Cornwall Conservation Trust’s Rattlesnake Preserve. The beaver is a semi-aquatic mammal and the largest native North American rodent. Mature males weigh 9 to 18 pounds but can weigh over 22 pounds. Only one litter of four to six kits is produced each year from April to June following a 100 to 105 day gestation. At two years, beaver leave the home colony to search for winter quarters, a journey that may take them up to 10 miles away. The life span of beaver is 5 to 10 years with some living up to 20 years. In the mid-to-late autumn, beavers aggressively begin winter preparations. 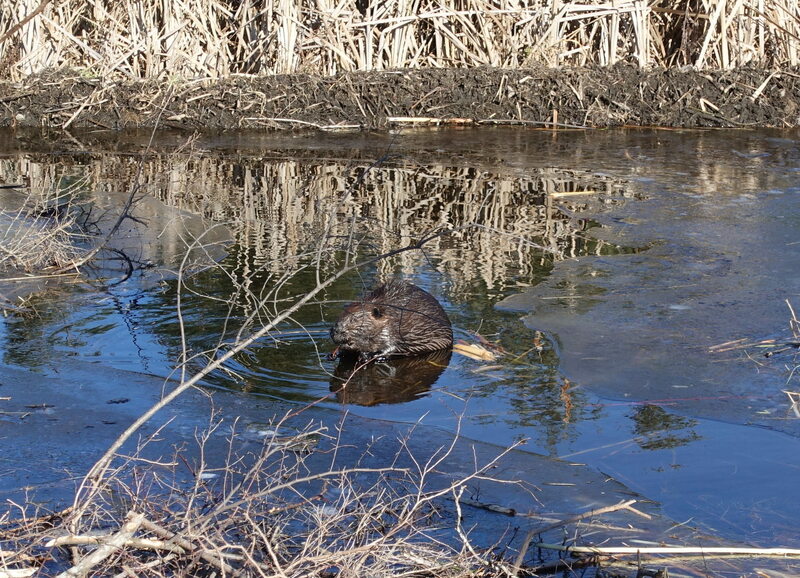 Since they require deep, ice-free underwater habitat, beaver create impoundments to provide a suitable working depth of standing water. Their activities include refurbishing the dam and building their food caches, and they have a special preference for witch hazel (Hamamelis virginiana). Because of their size, behavior, and habitat, beaver have few enemies. Mortality is highest during the first year, and coyotes are the main non-human predators in the Berkshires. Research indicates that beaver can maintain or increase their numbers while withstanding a rather disturbing annual trapping rate of 30% to 40% t because of compensatory reproduction. It is therefore no surprise that beaver numbers never seem to decline significantly in problem areas where removal is the major method of control: they are evolutionarily hard-wired to rebound to fill the niche or to avoid overpopulation conditions that would ultimately lead to resource exhaustion. 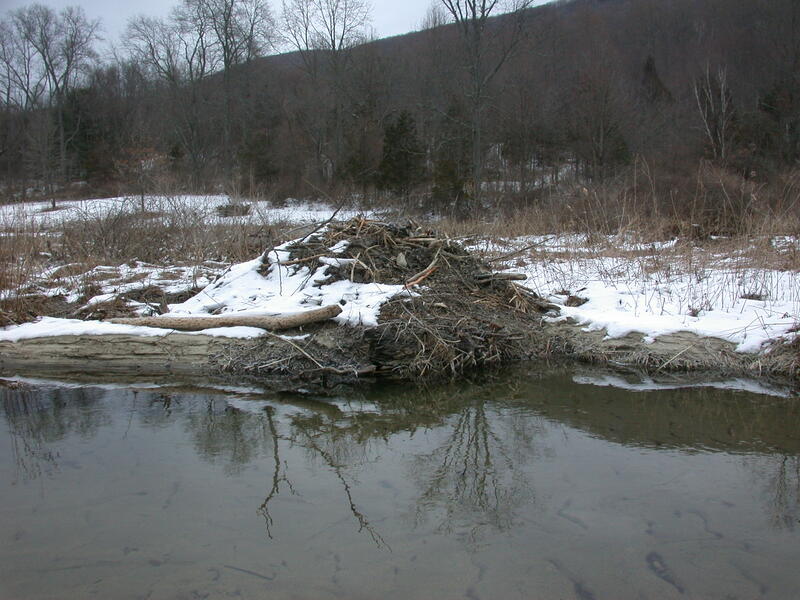 An old, active beaver lodge on Cobble Brook, Kent, CT.
Beaver-controlled wetlands provide niche services to wet ground, upland ground, tree bole, and shrub users. 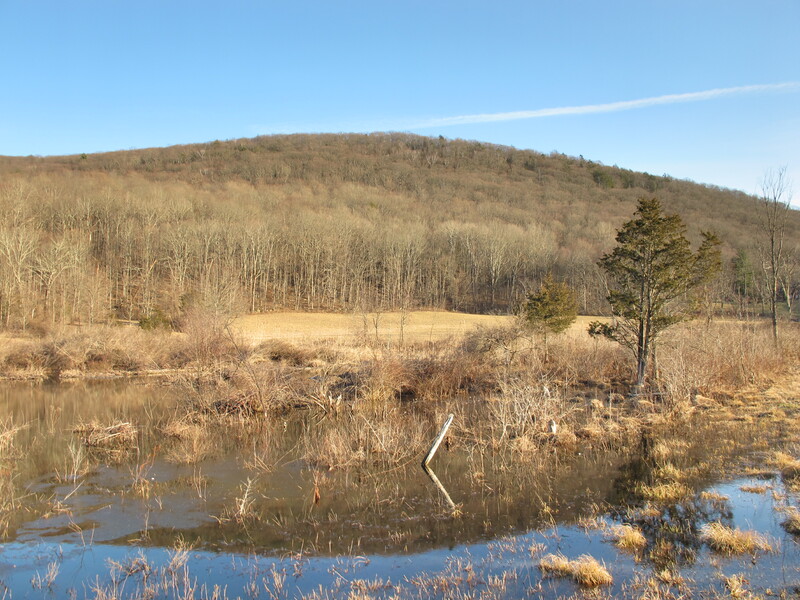 DeGraaf, in New England Wildlife: Management of Forested Habitats (USFS, 1989), cites 148 wildlife species that use this type of habitat complex. Among the more common are cedar waxwings (Bombycilla cedrorum), gray catbird (Dumetella carolinensis), white-eyed vireo (Vireo griseus) warblers of the genus Dendroica, muskrat, water shrew (Sorex palustris), and raccoon (Procyon lotor). The greater watershed complex supports mink (Mustela vison) and river otter (Lutra canadensis. Beaver activity can alter the native fisheries community of brooks due to the secondary effects of impounding water. A decrease in flow velocity and volume leads to increases in summer water temperatures with a subsequent decline in dissolved oxygen (DO) levels. Beaver activity dominates aquatic systems and they may cause shifts away from optimality for coldwater/high DO-dependent salmonids such as brook trout (Salvelinus fontinalis). Direct observation as well as various research datasets indicate, however, that brookies are able to penetrate gaps in dams, thus avoiding sub-optimal conditions and isolation. Recent articles in the ecological literature indicate that the regional beaver population is at only 25% of its historic level with many populations facing continuous harvest because of public safety, property damage, and reactionary concerns. There has been a revolution in beaver management of late, particularly in the use of beaver bafflers and excluders that allow beavers to live without flooding human infrastructure. The challenge is to get this information transferred to those whose first reaction to beavers is to trap them and use a backhoe to destroy their dams. We need not kill this important underlying force in landscape biodiversity and food web vigor. Next articleForests or Rabbits? Really?